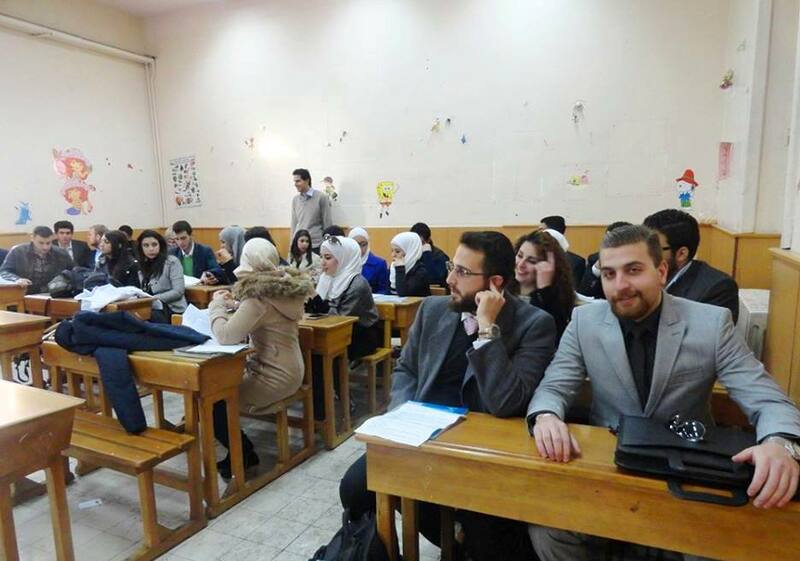 Students take an exam at a Syrian private university. DAMASCUS– Every day at 1:30 in the afternoon, the bells ring at the Mohammed Salahuddin Al-Habaj Secondary School for girls, in the Syrian capital’s Mezzah neighborhood. The female students head out, making room for a group of older male and female students to enter the building—students from Qasyuon University. 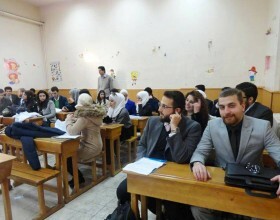 “The deteriorating security conditions and the inability of many students and professors to get to the main campus have led us to obtain the approval of the Syrian Ministry of Higher Education to rent the school building temporarily so we can continue to hold classes,” said Mohammed Al-Jalilati, president of Qasyuon University, whose main campus is located about 50 kilometers outside the capital on the Damascus-Amman international highway. This kind of arrangement is no longer unusual among private universities in Syria. Before the war, their main campuses were often located outside the city center in districts that are either no longer safe or are difficult to get to safely. Ittihad Private University, founded in 2003 in Raqqa, a city in northern Syria, has also moved its campus, to the Institute of Fine Arts in Mezzah. The International University for Science and Technology (IUST) moved its faculty of pharmacy to a temporary campus at a public sports facility in central Damascus. Classes sometimes run well into the evening hours at these makeshift campuses. Long periods of power outages are common in the capital; the universities use generators to provide electricity. Heat, however, is not available because of the lack of diesel fuel. The temporary campuses seem safer in their locations in the center of the capital—though there is always the risk of mortar shells—but they do not appear to be well suited for university education. Students suffer from overcrowding in the small school classrooms, which lack any soundproofing and contain nothing but wooden seats. Students studying the sciences have no opportunity to do practical training in a proper laboratory. Students suffer from overcrowding in the small school classrooms. Al-Jalilati, the president of Qasyuon University, similarly said that he feels 80 percent of the university’s educational needs are being met at the temporary campuses. And yet there is something missing. “The problem is in the general atmosphere, especially for new students, who do not feel that they have moved to a different educational level,” said Agha. Both private and public universities are also facing a significant drop in the number of available professors. “The majority of our qualified professors have left the country,” said Marwa, a fifth-grade pharmacy student at IUST. 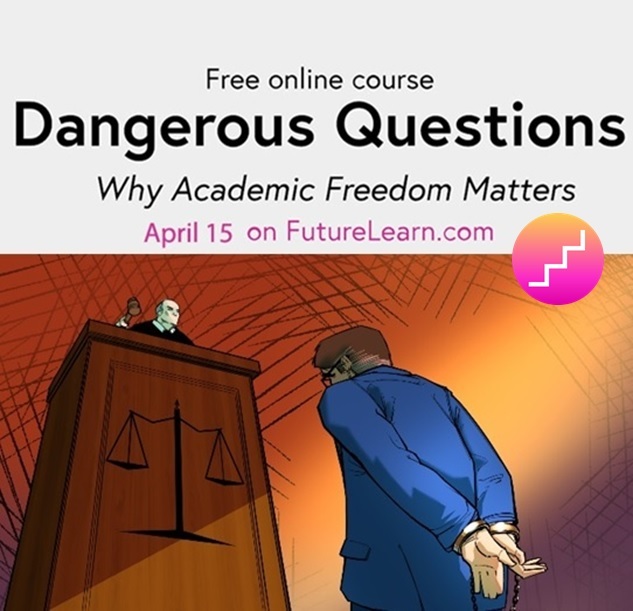 “The new professors have much less experience, and some of them do not hold doctoral degrees,” she said, adding that some courses have been canceled and some professors are teaching more than one course, sometimes across multiple subjects. Sameh Barqawi, a second-year business administration student at IUST, said the university had discontinued instruction in some disciplines entirely due to insufficient numbers of students and shortages of professors. “The university did not admit new students in the disciplines of English literature and information technology this year,” he said. Agha denies that there is a shortage of qualified teachers, at least when it comes to private universities. “Private university professors earn very good salaries compared with those at public universities, up to more than five times as much. There have certainly been some professors who have decided to leave the country, but we do not suffer from a shortage in teaching staff,” he said. Two years ago, a local newspaper quoted sources at Damascus University saying that about 10 percent of that institution’s professors had left Syria, lured by attractive offers from universities in other Arab countries. There are no recent statistics in this regard for Syria’s private universities. The declining number of students, however, is clear. Al-Jalilati says the drop “exceeds what we expected. 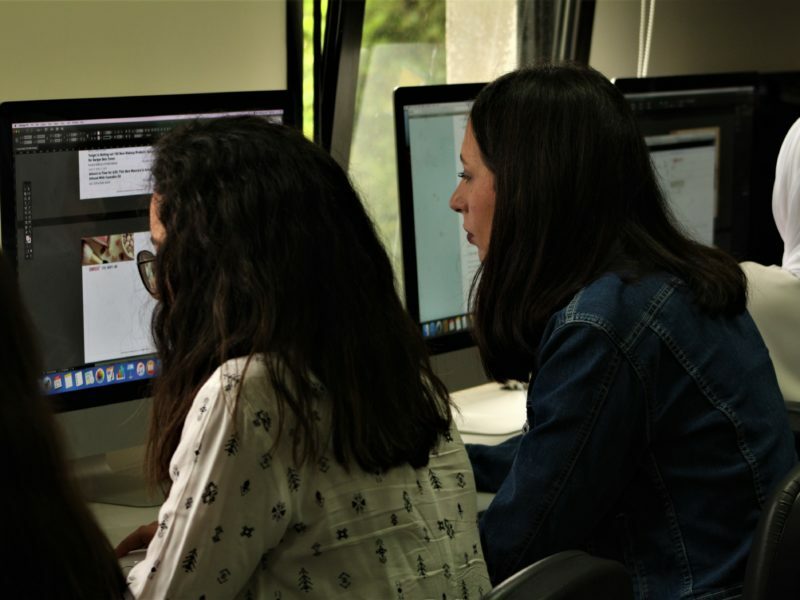 We have 50 new students this year; two years ago we had more than 300.” Today there are about 20 private universities in Syria, and they enroll about 32,000 students, according to the ministry of higher education. This number is quite modest compared with the number of students enrolled in public universities. Damascus University alone has about 140,000 students. 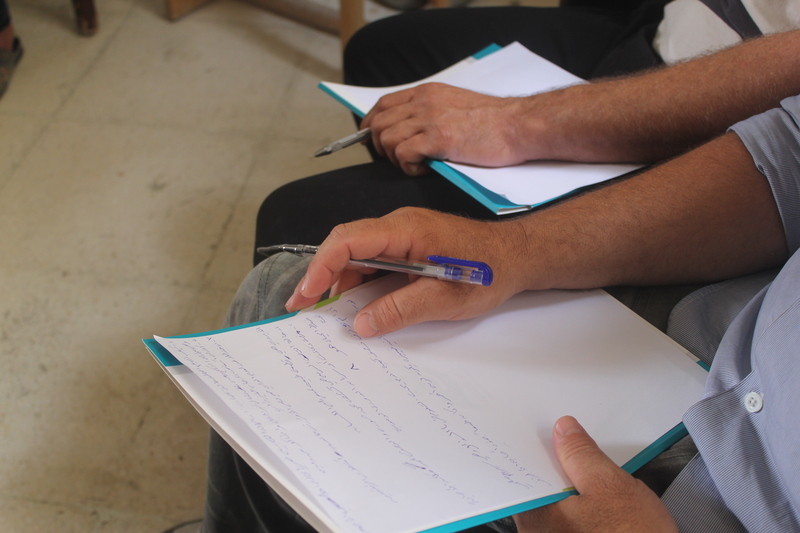 In general, Syrian universities have witnessed a sharp decline in the number of students; the drop is particularly apparent among men, who are required to complete military service. According to a preliminary study by Hanna Salloum, a scholar at Damascus University’s Faculty of Sociology, the number of male students in humanities faculties has declined by about 20 percent, and by about 35 percent in scientific faculties. 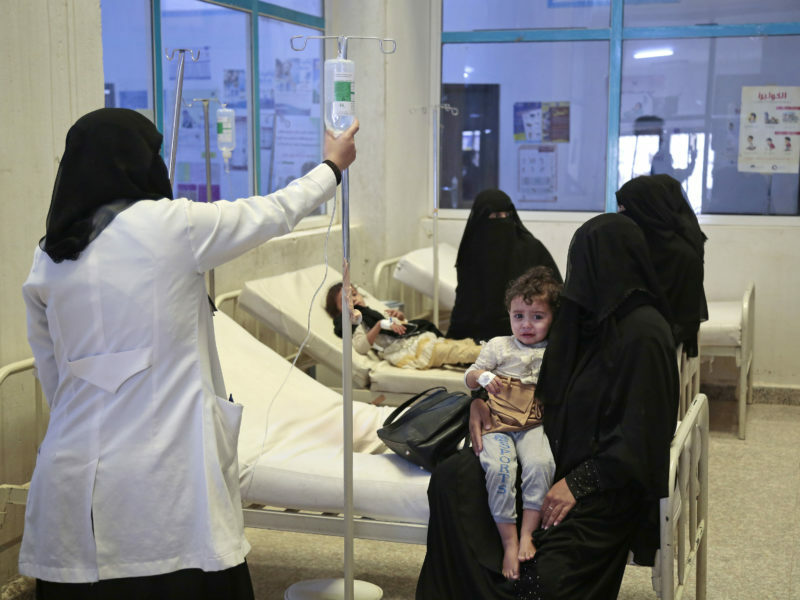 One year’s tuition at the medical faculty of a private university costs at least 900,000 Syrian Pounds (about $4,000), and about 160,000 Syrian Pounds at a faculty of business administration. Those are very large sums of money considering that the average annual wage in the country is currently $300 at best. Agha justifies increased tuition for new students by pointing to the current situation in Syria. 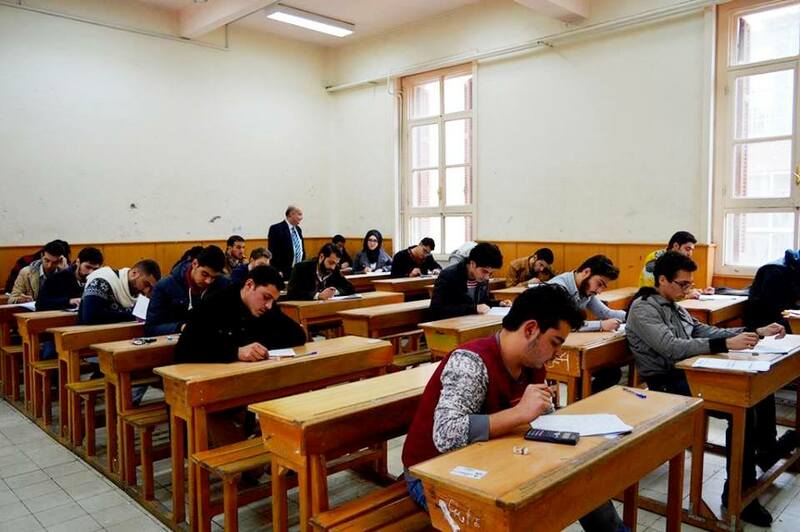 “For four years, universities have complied with the ministry’s instructions not to increase tuition, despite the sharp drop in the exchange rate of the Syrian Pound. But as we’ve been forced to rent temporary campuses, it has become necessary to increase fees to cover our expenses,” he said. According to the law that regulates university operations, any increase in tuition for currently enrolled students at private universities is calculated by the Higher Education Council and issued by the minister of education with the consent of the Council, taking into consideration the rate of inflation. 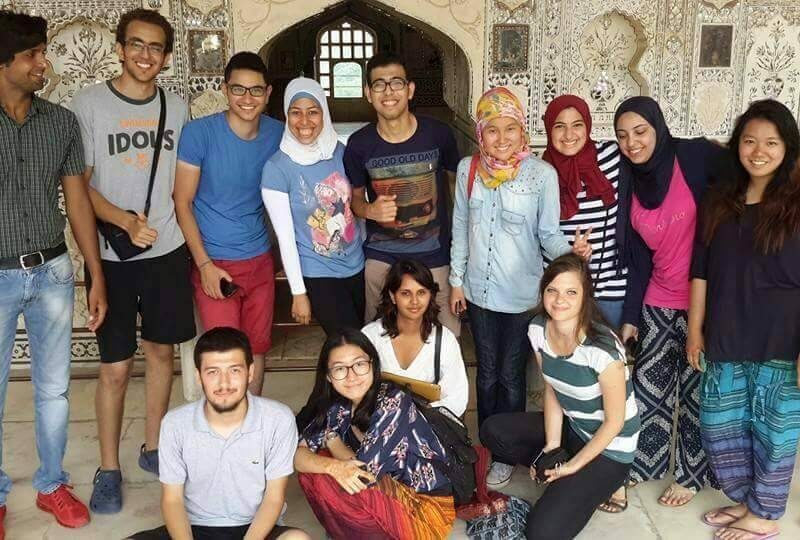 Arab students can learn new skills working as volunteers on social projects in other countries.